Founded in Saudi Arabia at the dawn of the mass adoption of the Internet in 1998 as a humble corporate ISP NourNet decided early on and in its own words to take, “the road less travelled.” Espousing a simple mission statement, “Empowering enterprises with end-to-end communication services that are world-class and competitive” with a clear-eyed focus to always leverage cutting-edge technologies to offer their customers the latest and best converged network services. Encompassing networks, application infrastructure, collaboration and security. The bedrock of NourNet’s corporate philosophy is predicated on the several key pillars on which they have built their business: Gaining customer trust, a recognition that corporate connectivity is never just about circuits, but an intimate understanding of how their customers put their networks and infrastructure to use, focusing on how customers conduct their business, and an ability to look at industry peers as partners. A network that connects: Primarily providing an enterprise network that is fast, reliable and secure. Across an aggregated and Kingdom-wide IP network via both an MPlS network platform. 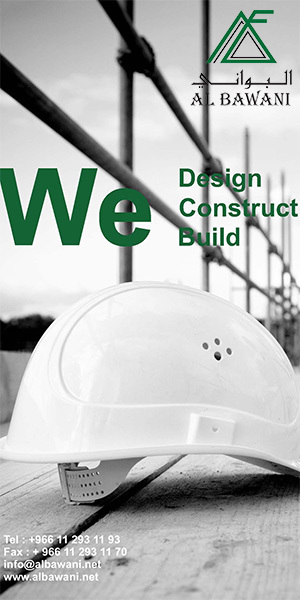 Built on the cutting-edge technologies and providing a single platform designed to connect across all enterprise locations within KSA. Secondly via a managed Internet, allowing clients to distribute premium clean-pipe Internet to multiple locations with built in enterprise security and compliance policies integrated into their cloud. 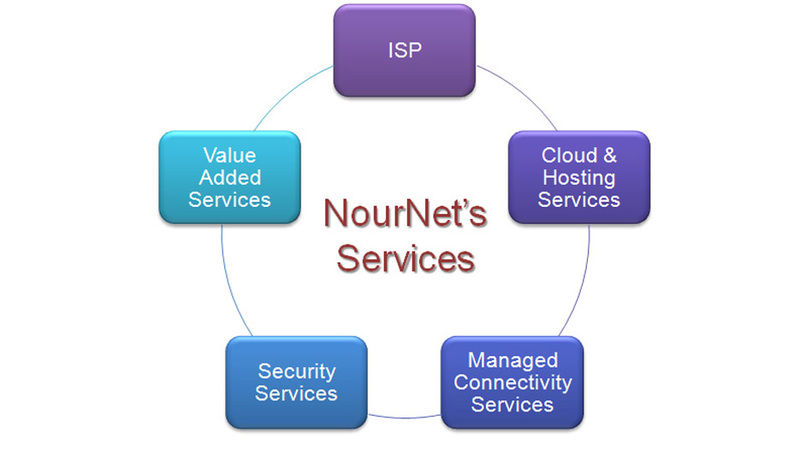 The key advantages of NourNet’s network being numerous: 1) Last mile media 2) Carrier diversity 3) A strong footprint with Kingdom-wide availability 4) QoS support with traffic prioritization 5) 24/7 NOC monitoring all clients links around-the-clock with proactive action and alerting 6) Strong service-level agreements tailored to specific client requirements. 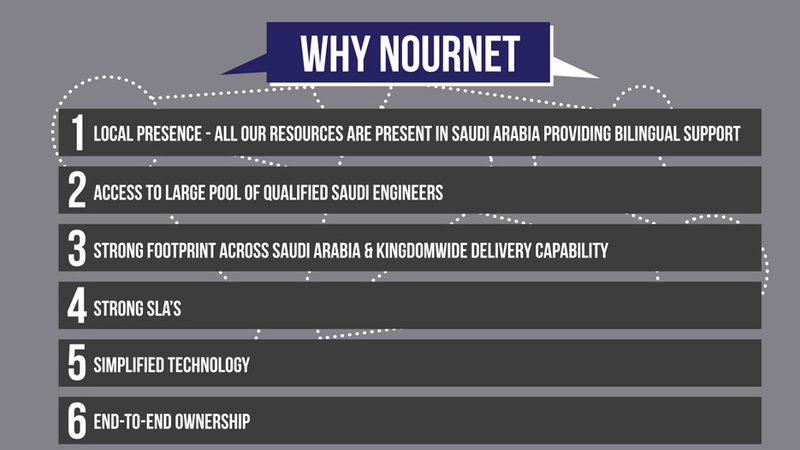 Infrastructure for your applications: NourNet offers a resilient and reliable infrastructure from their tier-3 data centers within KSA. 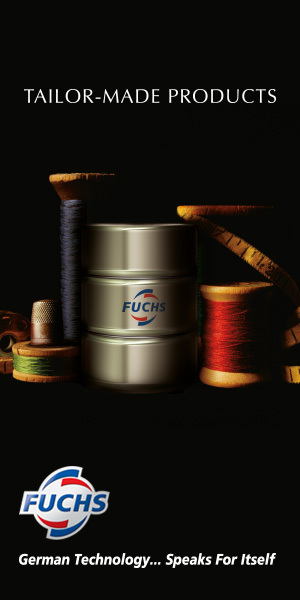 That is both scalable to support clients’ growth needs, whilst remaining flexible enough to provide the best price/performance ratio in the Kingdom. Offering both colocation and cloud computing. Served by 4 separate Telco’s, with multi-level network & infrastructure security, optimized power consumption and with 24/7 monitoring. Whilst the advanced architecture cloud configuration offers multiple-hosting options either via secured private cloud in Nournet’s data centres, on-site or even in a hybrid environment. Managed IT services: Designed to foster efficiency optimized approach by outsourcing operational IT tasks and focusing on strategic IT initiatives. 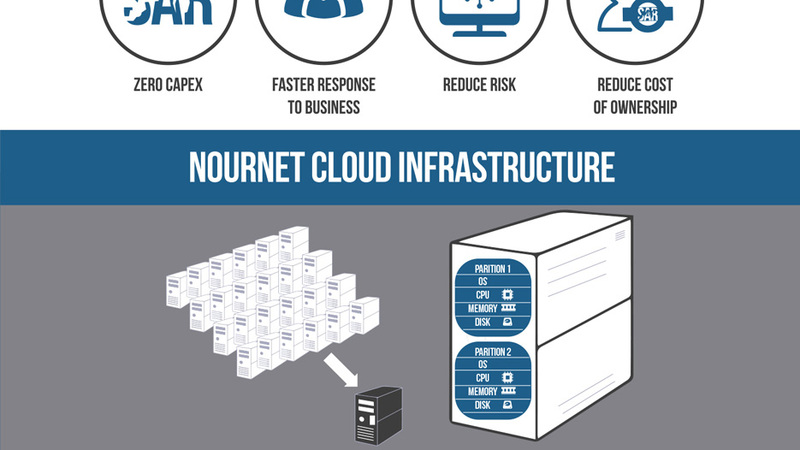 NourNet offer enterprise class resources designed to help businesses manage & monitor their clients’ entire IT infrastructure 24/7. All helping to eliminate or alleviate; daily fire fighting, interoperability issues between multiple suppliers, minimized infrastructure risks, and to remove any unforeseen unpredictability from IT spending. United collaboration: Given that the manner in which businesses now work, with workflow becoming ever more collaborative and with knowledge workers increasingly embracing a mobile lifestyle, NourNet offer a carefully designed collaboration portfolio. Enabling planned and ad-hoc video & voice communication from any network or Internet connected device, the suite of collaborative services encompassing: e-mail, audio/video conferencing, web conferencing and visual collaboration. All of which are delivered in a one-pack solution including: equipment, collaboration, connectivity and managed services. Enterprise security: With enterprise workers no longer confined to a physical location, todays’ enterprises operate from wherever their personnel can access cloud-based applications. Thus airports, coffee shops, restaurants and private homes have all become workspaces and given that employees also increasingly access corporate networks using their own devices to access corporate data. These combined factors have made enterprise security extremely challenging. So whilst security appliances protect applications, mobile-use of these applications have become more vulnerable than the applications themselves. 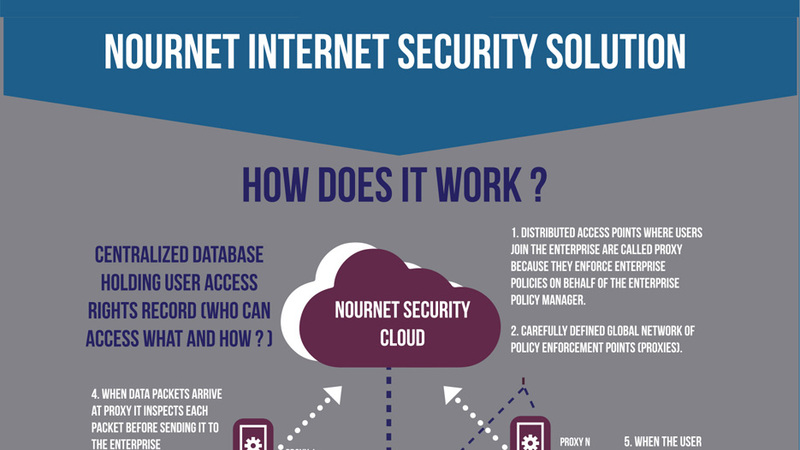 Resulting in the need to add an enterprise grade security layer to the Internet its self precisely what NourNet cloud security does. Turnkey IT projects: With most IT customers suffering from vendor lock-in and resulting in vendors pushing their technologies irrespective as to whether they are fit-for-purpose. NourNet aims to address that mal-practice by leveraging their diverse skill-set ad end-to-end solution approach designing a turnkey IT services portfolio to best-fit client technology and budgetary requirements. As the Kingdom grows, it’s IT businesses see opportunities to play a role at the vanguard of its expansion, with companies like NourNet hoping to leverage their location to adapt global-services and local expertise to the Arab context. To create an IT hub in Saudi Arabia servicing the 300 million people in the region. “From my view, the technology market is passing through a huge service redefinition exercise, hardware companies are expanding into software industries, software companies are shifting their business model into services, and so everyone is reshaping. The telecoms companies are trying to become ICT players, and the ICT players are trying to become cloud and solution providers. It is a very interesting time before the market, matures and shapes its direction, both locally & globally.” Amjad Hafez told us.